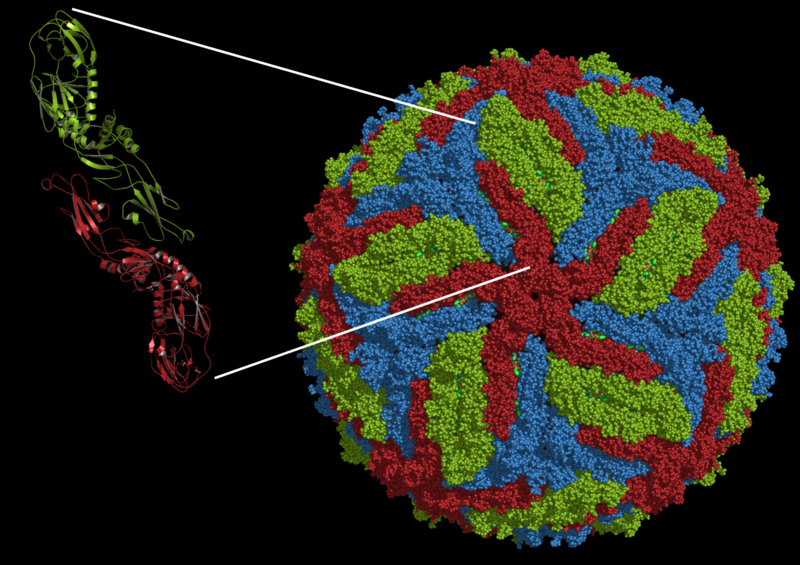 Model of Zika virus particle. E glycoprotein dimer is expanded at left. 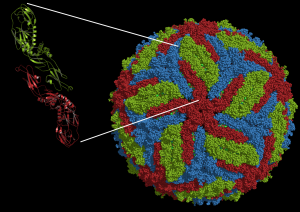 It has been speculated that the development of neurological disease and fetal abnormalities after Zika virus infection may be due to the presence of antibodies against other flaviruses that enhance disease. In support of this hypothesis, it has been shown that antibodies to dengue virus enhance infection of cells by Zika virus. There are four serotypes of dengue virus, and infection with one of the serotypes generally leads to a self-resolving disease. When a different serotype is encountered, antibodies to the first serotype bind virus but do not block infection. Dengue virus then enters and replicates in cells that it does not normally infect, such as macrophages. Entry occurs when Fc receptors on the cell surface bind antibody that is attached to virus particles. The result is higher levels of virus replication and more severe disease. This phenomenon is called antibody-dependent enhancement, or ADE. Because dengue and Zika viruses are antigenically related, an important question is whether antibodies to dengue virus can enhance infection with Zika virus. To answer this question, the authors used two broadly neutralizing anti-dengue virus monoclonal antibodies that had been previously isolated from patients who recovered from infection. These antibodies recognize the viral E glycoprotein; specifially, a loop of the protein involved in fusion of the viral and cell membranes. The amino acid sequence of this fusion loop region is the same in dengue virus and in Zika virus. The two anti-dengue virus mAbs bind the Zika virus E glycoprotein and also recognize Zika virus infected cells. However, when mixed with Zika virus, they do not neutralize infectivity in a cell line made from rhesus monkey kidneys. But when the antibodies were tested in Fc receptor-bearing cells, Zika virus infection was enhanced by over 100 fold. In the absence of dengue virus antibodies, levels of Zika virus RNA are very low. Serum from four patients who had recovered from dengue virus infection was also examined for enhancement of Zika virus infection. All four sera contain antibodies that neutralized all four serotypes of dengue virus, but only two neutralized Zika virus infection. All four human sera enhanced Zika virus infection of Fc receptor-bearing cells. Enhancement of Zika virus infection could be blocked when Fc receptors were blocked with anti-Fc receptor antibodies before virus infection. A control serum from a patient in Canada that did not contain antibodies to dengue or Zika viruses did not enhance Zika virus infection. These findings have one caveat: enhancement of Zika virus infection by antibodies against dengue virus was measured by PCR amplification of infected cell RNA, not by measuring the yield of infectious virus. The assumption is that increased intracellular viral RNA means more virus released from the cell, but this remains to be confirmed. It will be important to confirm these findings in animal models of Zika virus infection, and in humans. If true, they have wide implications. If antibodies against dengue virus enhance Zika virus infection in humans, more severe disease might be observed in areas such as Brazil where both viruses co-circulate. It will be necessary to determine if Guillain-Barré syndrome, other neurological complications, and birth defects correlate with antibodies to dengue virus. Perhaps Fc receptors on the placenta and neural tissues allow entry of Zika virus only when bound to dengue virus antibody. It is also possible that antibodies to Zika virus might enhance dengue virus disease. These observations do not bode well for Dengvaxia, a tetravalent dengue virus vaccine that has been recently licensed in Brazil, Mexico, and the Philippines. Might anti-dengue virus antibodies induced by this vaccine make Zika virus disease more severe? This outcome would be a tragedy, as many years of work has gone into making this vaccine to prevent severe disease caused by dengue virus infections. Second generation dengue virus vaccines such as TV003 are already moving through clinical trials. It is essential to determine as soon as possible if antibodies induced by Dengvaxia and TV003 enhance Zika virus disease. If so, it will be necessary to assess whether deployment of this vaccine should proceed. Dengvaxia consists of the yellow fever virus vaccine strain 17D in which the E and prM viral membrane proteins are substituted with those of dengue virus. In contrast, the attenuated TV003 vaccine has only the dengue virus genome. Would a vaccine consisting of TV003 plus an attenuated Zika virus vaccine solve potential problems of antibody dependent enhancement of disease? Update 4/28/16: Over on Twitter someone asked, “any idea why we DON’T see severe disease in parts of Africa/Asia where dengue and Zika co-circulate”? Good question, too long an answer for Twitter. The easiest is that in humans, there is no antibody depencent enhancement of Zika virus infection by dengue antibodies. But if there is ADE, then there are a number of possible explanations. First, there have not been enough cases in Africa, nowhere near the numbers in the Pacific and South America. There were certainly some cases of Guillain-Barré syndrome associated with some of the Pacific outbreaks – which I would consider more serious disease and could be potentiated by dengue antibodies. I also think that Brazil is hyperendemic for dengue virus, with multiple serotypes circulating and people having multiple infections. But the recent outbreaks are much larger than before, and dengue antibody induced complications of Zika virus infection might only be observed in larger outbreaks. The authors of the paper discussed in this post suggest that the introduction of Zika virus into a completely naive population could also be a factor, as the age of exposure. Maybe a robust anti-Zika virus antibody response, in a non-naive population, can temper any effects of dengue mediated ADE. Very interesting results even though I am not surprised. Follow up studies should include testing the sera from pregnant women who’s baby developed microcephaly for further evidence of “heterologous” ADE in zika infection. Since many of the countries currently affected by zika virus has/had circulation of multiple DENV subtypes, it will be important to see if there is a correlation between DENV exposure history in pregnant women and cases of microcephaly. I also agree regarding your concerns about the use of Dengvaxia. Not only because of the spread of zika, but also because of the consequences of non-compliance with the 3-dose vaccine regime and the risk of DHF. Any dengue antibody will enhance dengue virus at some dilution. Moreover, dengue antibodies can enhance West Nile, Japanese Encephalitis and Yellow fever virus infection of Fc receptor bearing cells. The reverse is true as well-i.e. JE, WN and YF antibodies can enhance dengue. A flavivirus vaccine serum sample will enhance dengue or another flavivirus at some dilution. Therefore, it is expected that dengue antibodies will enhance Zika. The challenge for the field is to understand antibody virus interactions that may lead to virus and disease enhancement in people. Current models do not accurately predict this. Just because something is expected, does not mean that the experiment to prove it should not be done. This experiment was essential (many others are also doing it) and more work needs to be done to validate it in animals and humans. I understand your desire to understand mechanisms, but first the basic observations have to be obtained. This make me remind the ADE happened on PRRSV-a virus cause pigs severe and acute respiratory disease. A professor working on PRRSV told me that several swine virus’s antibody can promote ADE of PRRSV in his experiment 2 month ago. that’s wired. Am J Trop Med Hyg. 1988 Jan;38(1):205-7. Heterologous flavivirus infection-enhancing antibodies in sera of Nigerians. Fagbami A, Halstead SB, Marchette N, Larsen K.
As discussed in great length on http://microbe.tv/twiv/twiv-388, the paper described here has not yet passed formal peer review. I for one could not care less. I know that the author of this blog peer-reviewed the paper, which provides more confidence than knowing that two or three unspecified anonymous scientists reviewed a published paper. I would rather read a paper without the cognitive bias introduced by knowing that it was accepted by a prestigious journal. more stringent formal peer review of that paper, which will probably be a good thing. Someday a preprint will attract public attention and will later definitively be shown to be wrong. This may damage the public trust of researchers and of science communicators. In the mean time, slow dissemination of results and uncritical acceptance of formally peer-reviewed papers are much bigger problems. Thank you for publicizing preprints. I hope you revisit this paper on TWiV once it inevitably gets published somewhere. The consensus from the TWiV discussion was that it is preferable to use the word ‘preprint’ in the first mention of the relevant manuscript and/or any (embedded) links. I worked overseas for many years mainly in the Caribbean, South & Central America. I was unfortunate enough to suffer through Dengue twice. The first time was bad enough but nowhere near as bad as the 2nd time. It’s a bone breaker level as far as pain is involved and left untreated can cause death should you have Hemorrhagic Dengue. The best preventative measure is to keep your suroundings clean because the Aedes Aegypti mosquito needs less than a 1/4 of an inch of clean water to breed. That means it can breed in an empty coconut shell, tree knots, gathered leaves, etc ….. and spend the rest of it’s living days biting people. I know this is an old post, but I’m hoping someone see’s it. I am trying to find if there is evidence for the reverse. I am reading a paper of a Zika vaccine that is using NS1 as the antigen in order to reduce risk of ADE of dengue following immunization. Has anyone seen evidence of this occurring?